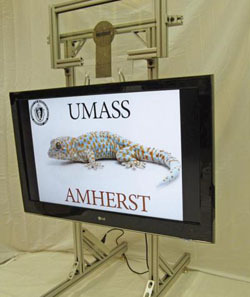 Amazed by the gecko’s ability to produce adhesive force, a team of researchers at the University of Massachusetts Amherst developed “Geckskin,” an integrated adhesive with a soft pad woven into a stiff fabric. Initial tests have shown that a section of Geckskin roughly the size of an index card can hold 700 pounds while adhering to flat surface and can be released with little effort, leaving no residue behind. AMHERST, Massachusetts – For years, biologists have been amazed by the power of gecko feet, which let these 5-ounce lizards produce an adhesive force roughly equivalent to carrying nine pounds up a wall without slipping. Now, a team of polymer scientists and a biologist at the University of Massachusetts Amherst have discovered exactly how the gecko does it, leading them to invent “Geckskin,” a device that can hold 700 pounds on a smooth wall. Doctoral candidate Michael Bartlett in Alfred Crosby’s polymer science and engineering lab at UMass Amherst is the lead author of their article describing the discovery in the current online issue of Advanced Materials. The group includes biologist Duncan Irschick, a functional morphologist who has studied the gecko’s climbing and clinging abilities for over 20 years. Geckos are equally at home on vertical, slanted, even backward-tilting surfaces. “Amazingly, gecko feet can be applied and disengaged with ease, and with no sticky residue remaining on the surface,” Irschick says. These properties, high-capacity, reversibility and dry adhesion offer a tantalizing possibility for synthetic materials that can easily attach and detach heavy everyday objects such as televisions or computers to walls, as well as medical and industrial applications, among others, he and Crosby say. Beyond its impressive sticking ability, the device can be released with negligible effort and reused many times with no loss of effectiveness. For example, it can be used to stick a 42-inch television to a wall, released with a gentle tug and restuck to another surface as many times as needed, leaving no residue. Previous efforts to synthesize the tremendous adhesive power of gecko feet and pads were based on the qualities of microscopic hairs on their toes called setae, but efforts to translate them to larger scales were unsuccessful, in part because the complexity of the entire gecko foot was not taken into account. As Irschick explains, a gecko’s foot has several interacting elements, including tendons, bones and skin, that work together to produce easily reversible adhesion. The key innovation by Bartlett and colleagues was to create an integrated adhesive with a soft pad woven into a stiff fabric, which allows the pad to “drape” over a surface to maximize contact. Further, as in natural gecko feet, the skin is woven into a synthetic “tendon,” yielding a design that plays a key role in maintaining stiffness and rotational freedom, the researchers explain. Importantly, the Geckskin’s adhesive pad uses simple everyday materials such as polydimethylsiloxane (PDMS), which holds promise for developing an inexpensive, strong and durable dry adhesive. The UMass Amherst researchers are continuing to improve their Geckskin design by drawing on lessons from the evolution of gecko feet, which show remarkable variation in anatomy. “Our design for Geckskin shows the true integrative power of evolution for inspiring synthetic design that can ultimately aid humans in many ways,” says Irschick. The work was supported by the U.S. Defense Advanced Research Projects Agency (DARPA) through a subcontract to Draper Laboratories, plus UMass Amherst research funds. 6 Comments on "Super-Adhesive “Geckskin” Material Holds 700 Pounds"
I have been searching the Net for a retailer ho actually sells original Geckskin. To date, I’ve not been successful. Can you please tell me how/where to purchase this wonderful product? Thank you so much. I am, almost two years after, also looking for Geckskin online. I wonder, have you succeeded? Do you know where we can buy this product? I also can’t find any Geckskin apart from the website that only sells small pieces of tape. I am also looking for this product online. Have you found a website yet?